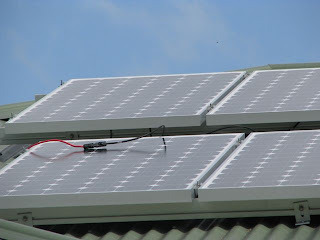 Our solar photovoltaic system was connected to the grid via feed-in meter last week. Initially I was told that they would need to replace my existing 3 phase meters with a single poly-phase meter. But all the contractor did was install another meter. Integral Energy, the regional electricity provider, installs the feed-in meter in a gross-feed-in configuration. This means that the feed-in meter counts all the energy that we generate and not just the excess energy at any point in time. So if feed-in rates are increased we will be credited for all the energy we produce. Presently the feed-in rate is roughly the same as the usage rate: 14.62 c/kWh (excl. GST).